Since 2010 I have been the AATE (Australian Association for the Teaching of English) Treasurer; I also undertake the same role for my local Tasmanian association (TATE) of which I am a Life Member. Participating actively in my professional teaching associations since 1980, and a now retired English teacher and high school principal, I have managed a number of national projects on behalf of AATE, including work for AITSL, ASIC and the English for the Australian Curriculum (E4AC) project. As well as my current work for Reading Australia, I am the local conference organiser for the 2017 AATE/ALEA national conference in Hobart, Cutting Edge: margin to mainstream. As a result of work done on the E4AC project, AATE and I, along with ETA NSW, were invited to manage the structuring, development, writing/production, reviewing, editing and preparation for publication of the secondary teaching resources for the selected Reading Australia texts. Whilst I ultimately co-ordinate all work for both associations, I specifically manage the production work at all stages for those teaching units prepared by AATE writers. Coming on board at the birth of the program in 2013, both associations developed the secondary unit writing template and have been closely involved in text selection for new teaching units since. Our involvement is continuing, especially with the development of more teaching resources for young adult fiction titles. Secondary English teachers face a large number of often conflicting pressures across a range of professional concerns, not the least of which relate to curriculum or syllabus implementation and text selection. Reading Australia is a tremendous asset to English teachers across the country for a number of reasons. 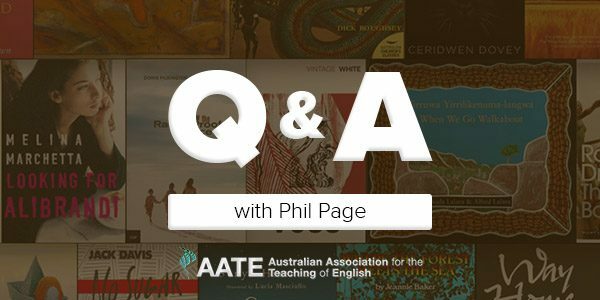 Firstly, it rightly places Australian literature in all its forms – squarely and legitimately – in Australian classrooms, alongside the traditional canon(s) of English and world literature. In so doing, it forefronts the great work done by a host of Australian writers across our culture and history and inclusive of all forms of writing. The RA resources will also open English teachers’ eyes to a range of quality Australian texts that they may not have heard about or been familiar enough with to undertake with their students. Indeed, when I first became involved with the project and subsequently, my experience of and appreciation for Australian literature and writers has been broadened exponentially. The RA teaching resources also provide a wide range of teaching approaches and activities specifically geared and matched to prescribed curriculum requirements. For busy teachers the RA resources provide flexibility through multiple entry points for their classes and students: they allow them to pick and choose activities, assessment tasks, additional resources and strategies that will suit their contexts whilst still maintaining the integrity of a quality English program. Teaching units span all the key facets and modes of English teaching: reading and viewing, writing and creating, speaking, listening and critical thinking. They are both student-centred and teacher-centred where required, whilst providing for differing student abilities within a group. Teachers can rely on these resources to deliver what they want for their students in their own classrooms while spotlighting our own home-grown texts. If supported appropriately by the public at large: our communities, institutions – societal, business, financial and regulatory – and governments, then I see the future of Australian literary creativity and literacy in general, as a very positive one. The quality of Australian writing in all genres, styles and contexts has never been better. However, there are several factors about which we need to be very aware and concerned. An underlying and pervasive one is that despite political and public rhetoric there is both a lethargy and indifference to quality public education in Australia. A cultural change is essential to move the demonstrated importance of our educational processes from political and media hype to actual reality. Allied to this growing cultural/attitudinal undertone is the divisive politicisation of education and the polarisation of debate around what we really need to meet the needs of coming generations. Other changes, including the reduction of the existing copyright period to a ridiculous 25 years and the removal of the current sensible regulations regarding appropriate remuneration for the use and reproduction of Australian texts of all kinds in libraries and educational institutions, negatively affect both producers and consumers of Australian work and should be strongly resisted. A tough one. One of the great pleasures of the RA project has been the opportunity to read so many outstanding texts which I either hadn’t heard of or with which I was only passingly aware. I have favourites across all genres including: Judith Wright’s Collected Poems, David Malouf’s The Complete Stories, Chloe Hooper’s The Tall Man, Wesley Enoch and Deborah Mailman’s The 7 Stages of Grieving, Helen Garner’s The House of Grief, Shaun Tan’s The Arrival and Kim Scott’s That Deadman Dance. But, if forced to nominate one only, I’d go for Robert Dessaix’s A Mother’s Disgrace.